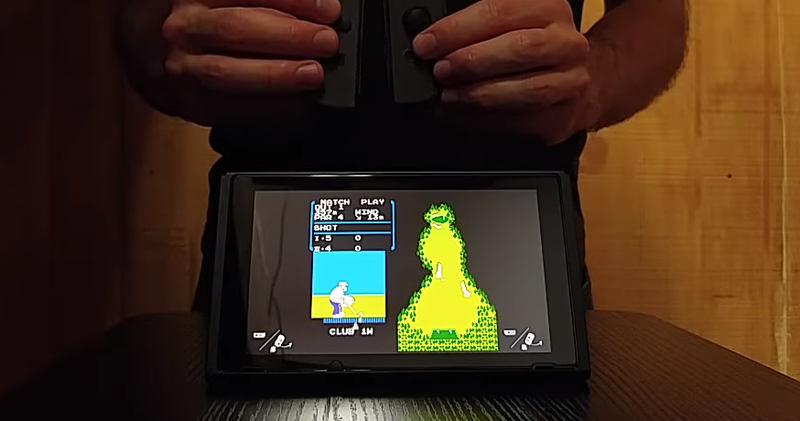 A few months ago Switch hackers showed the handheld had a hidden emulator designed to play NES Golf but only on July 11th, the date Satoru Iwata, former President of Nintendo and the game’s programmer, died. Now they say the company has overwritten the code as of the 4.0.0 firmware update. According to Switchbrew.org, these revisions effectively gutted the code used to launch the game. “Flog was stubbed: official code for launching it was removed from the home menu, and *all* code was overwritten with garbage. Thus, even attempts to launch it manually will result in loader returning error 0xA09,” reads revision notes published yesterday. “Flog,” or golf spelled backwards, was a portion of the Switch’s home menu code dedicated emulating NES Golf when certain conditions were met. When players used the Joy-Con to do Iwata’s Nintendo Direct sign-off gesture on July 11th, the game would boot up and be playable using motion controls. The specifics surrounding the game, and the fact that it was one of Iwata’s, made the Easter Egg seem like an intentional tribute to the late Nintendo icon. However, Nintendo refused to comment on the topic, and was especially cagey about the subject during an interview with Kotaku back in autumn. Even then, the game could only be accessed on older versions of the Switch, an indication that Nintendo had not planned for it to be accessible yet or possibly at all. This latest discovery seems like the logical conclusion of that position, with the company effectively scrubbing Flog from the console entirely.